Ever since the Kepler space probe began finding hard evidence of the existence of exoplanets – i.e. planets orbiting suns outside of our Solar System – scientists have been working hard to determine what conditions on these worlds must be like. For instance, it is known that planets that orbit closely to their red dwarf parent suns are tidally locked – meaning they do not rotate on their axis. This, in turn, has led to the proposal that any watery worlds in the vicinity could form what’s called an “Eyeball Earth.” Being directly under the local star, with one side perpetually facing towards it, the light would be intense enough to melt a circular patch of water, while the rest of the planet would remain locked in a deep freeze. In short, not an ideal situation for supporting life. However, a new three-dimensional model has been created, thanks to the efforts of two researchers at Peking University. In their research paper, they suggest that ice and oceans on these planets would be dynamic, which is both good and bad. Basically, it means an Eyeball Earth has a narrower habitable zone, but that more of the surface has the potential to support life. It also means that the “eyeball” looks more like a lobster! This paper represents the next step in scientific analysis of exoplanets. 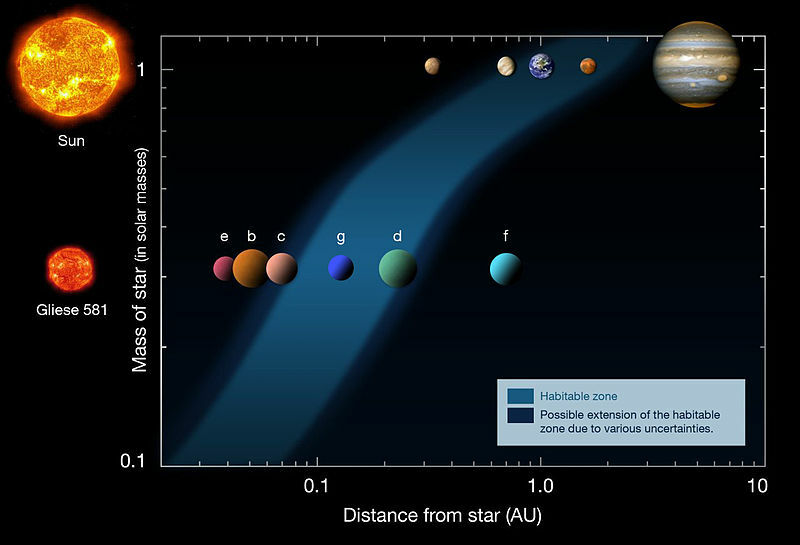 Initially, estimates of habitability – i.e. temperatures that could allow liquid water on the planet surface – were based on a single analysis of the planet’s atmosphere to see how much light reaches the surface. But, in the real world, atmospheres form clouds, distribute heat through winds and convection, and exhibit other sorts of complex behavior. These are the sorts of things that are handled in the full, three-dimensional climate models built to study the Earth. Hence, the Peking research team adapted these same models to handle exoplanets that differed significantly from Earth. But these models didn’t capture a critical part of the distribution of heat on the Earth: the ocean circulation. Instead, it treated the entire ocean as a two-dimensional slab. The new study corrects for that by using a coupled ocean-atmosphere climate model, the Community Climate System Model version 3. 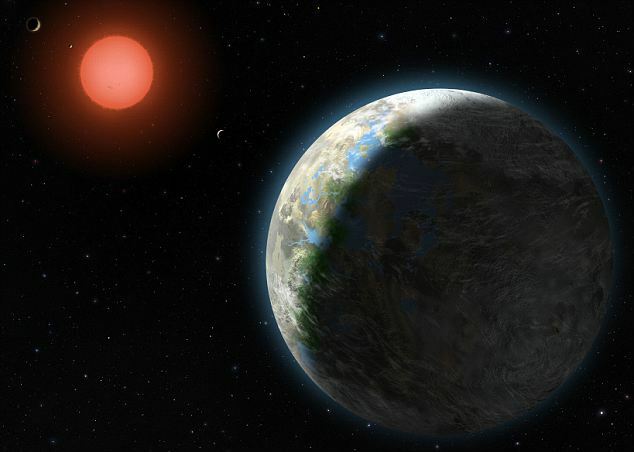 For their study, they used Gliese 581 g, a potentially Earth-like planet orbiting in the habitable zone of an red dwarf star 20 light years away. 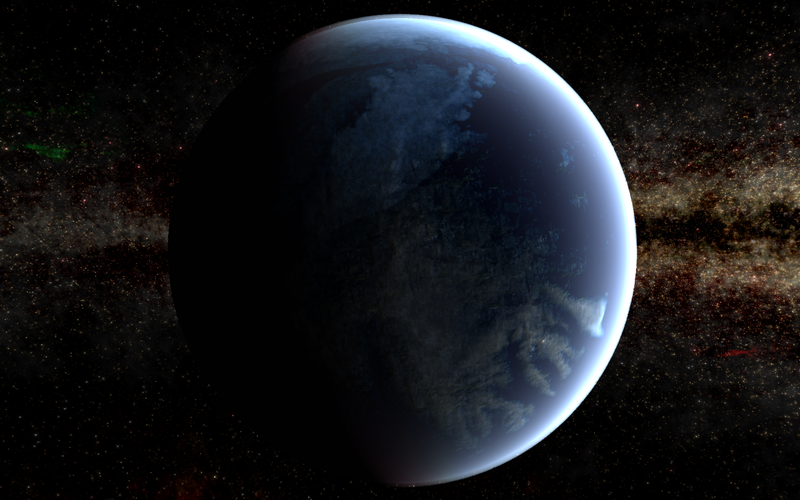 This planet, coincidentally, is ranked by NASA as being the most Earth-like exoplanet yet seen in the known universe. Critically for the model, it’s close enough to its host star to receive 866 Watts/square meter at the top of its atmosphere (whereas the Earth receives 1,366). Since it is not yet known what Gliese 581 g’s atmosphere looks like, the authors assumed an Earth-like composition, but varied the amount of CO2 to change the intensity of the greenhouse effect. From all this, the planet was assumed to be covered in a deep ocean. After giving the model 1,100 years to come to equilibrium, the authors sampled a century of its climate. 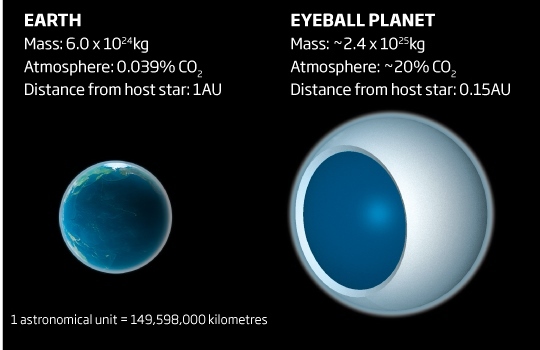 With carbon dioxide concentrations similar to the Earth’s (330 parts per million in the model), the “eyeball” vanished. That’s because ocean currents formed along the equator and brought in ice from the west that split the eyeball into two lobes that flanked the equator – which resemble the claws of the lobster. The currents then transferred heat to the eastern portion of the planet, which melted the ice to form the lobster’s tail. In addition to the ocean current that altered ice distribution, an underwater circulation (similar to the one on Earth) formed, which sent warmer water toward the poles. In the atmosphere, a jet stream also formed over the equator, which also distributed some heat to the unlit side of the planet. Ultimately, the new model suggests the habitable zone of watery planets near red dwarfs is a bit more narrow than previous studies had suggested. The good news is that, in this model, the ice never got more than 3m thick on the dayside of the planet. That’s thin enough to allow light to reach the water underneath, meaning photosynthesis is a possibility over the entire dayside of the planet. Although this model is a major improvement, it still lacks a key feature that’s likely to exist on planets – namely continents, or at least features on the seafloor that differ greatly in height. These will radically alter the currents on the planet, and thus radically alter the distribution of heat within the ocean. Unfortunately, this information is even harder to come by at present than atmospheric conditions. 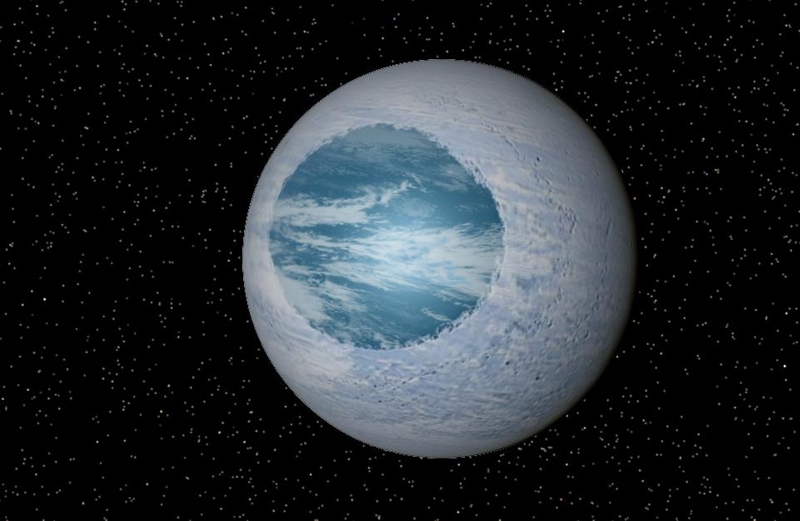 So for the time being, all we really know about Gliese 581 g and other similar exoplanets is that their surfaces are icy, but habitable – not unlike the Jovian moon Europa. However, that is not to say that we won’t have more information in the near future. With Kepler still in operation and the Gaia space observatory now in space, we might be able to construct more detailed models of nearby exoplanets in the near future. Also a coincidence, Gliese 581 g just happens to be the setting of my writers group’s upcoming anthology, known as Yuva. And with this latest bit of info under our belts (basically, that the entire planet is a big, watery ball), I imagine we’ll have to adjust our stories somewhat!